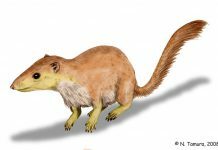 One of the most interesting facts about Megazostrodon is that not all paleontologists agree whether this animal was the first mammal to walk the Earth or not. Some scientists believe it is the transitional animal that bridges the gap between therapsids and mammals. Other paleontologists view it as just another mammal to have lived during that time period. What is known about these animals, however, is how they looked. 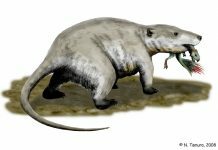 If you look at Megazostrodon pictures, then you’ll clearly see these mammals looked very much like little shrews. And they weren’t much bigger than modern shrews. This mammal was about 4 inches long and weighed maybe an ounce. Not very big at all. 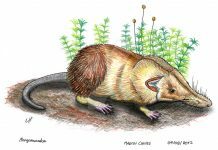 Since it was so small, Megazostrodon was probably nocturnal and had to hunt for its food at night. That kept it safe from some of the larger dinosaurs in southern Africa. It was able to see at night because it had excellent eyesight and a larger than normal brain. It also had exceptional hearing that allowed it to keep an ear out for any predator that might want to make it dinner. What did Megazostrodon eat? Well, while it isn’t currently known exactly what this animal ate, scientists do believe that it probably lived on any insects or plants that it could find. It may have also tunneled into the ground and lived off of roots.